The Electric Light Orchestra - hereafter called ELO - are probably not everyone's idea of what a chart-hit band should be. After all, they include a violin player and two cellists, and that's not normally the formula for Top Ten regulars. But ELO are different. They blend the classical sound of their strings with the sort of infectious rhythm that hits are made of. Hits that include Roll Over Beethoven, Evil Woman, Strange Magic, Mr. Blue Sky and the recent Sweet Talkin' Woman. When you consider that their last, highly-acclaimed album Out Of The Blue had advance orders of four million copies worldwide, it just goes to show the enormous impact the band has had on the record-buying public. I recently spoke to ELO's violin star, Mik Kaminski. "We're resting at the moment", said Mik. "We've worked ninety-two shows over the last nine months and we decided we were due for a breather. Mind you, there are quite a few solo projects on the go at the moment. I'm doing one with three friends from a college in Leeds." "Jeff Lynne (ELO's creator and writer) has decided to take it easier for a while. You see, Out Of The Blue was such a massive project for him that it's taking him quite a bit to get back into the groove. But there are a lot of ideas being played around with at the moment, and we should have a new album out by around March of next year." As mentioned earlier, three of ELO dabble in the string section - all three are classically trained. Mik, being one of them, explained how he came to join the band. "I'd left college and decided to try my luck in London. I cut my hair, smartened up a bit, and became a croupier in the Fulham Road, but found time to play with a few bands around London. I did this for six years, then saw an ad in the Melody Maker, which required a violin player for the Electric Light Orchestra. I had the right credentials for the job, and I was in." Mik certainly hasn't had any reason to feel regretful about his move. Firstly as a favourite of the critics, then as a big hit in America, and finally great success the world over, ELO can rightly be termed superstars. Continue Mik: "Australia, for instance, was great. On our first visit - nothing fantastic. But the second time around with the success of A New World Record, we had people queueing at airports to see us. There were loads of press and TV interviews, too. But the best thing of all was the concert we did at Sydney Outdoor Stadium, where we played to 26,000 people." "When we were over in Japan, we got a really good response too. But we weren't too happy about the TV showing of our gig at Wembley, which seemed to lose a little of the excitement we generated during that concert." Most of which was centred around songs from Out Of The Blue, which was written in Switzerland after one of ELO's extensive tours. Jeff Lynne takes up the story of the classic album. "I had decided to do a double album, and found myself in a mountain chalet, where I had installed all the equipment necessary to write: piano, moog, echo, guitars, amps, a Revox, two speaker columns, and this task I'd set for myself: write a double album in three weeks. The first four days I couldn't get a thing. I just looked at all that equipment and thought, 'what a funny job I have.' The fifth day I was playing bass notes on the moog, and out of that came Turn To Stone, which was written all on bass notes. I bashed on a bucket for drums, and punched the microphone for bass drums. Once I wrote that first song, the rest came much easier. Mr. Blue Sky was the hardest after that. It started as a chord sequence that I pounded for nine hours in a row one day. Some songs I can write instantly. Others, I can hear but can't immediately play. Mr. Blue Sky took a week." A little more about the hero and inspiration of ELO. 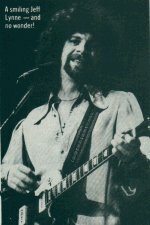 Jeff Lynne was born in Birmingham in 1947, and was therefore inspired by the Beatles in his early musical days. At fifteen, he taught himself to play a plastic guitar borrowed from a friend. In 1966, he got a Spanish guitar from his father, and shortly afterwards joined a local band, The Idle Race, for whom he wrote, sang and played lead guitar. His distinctive voice and musical style developed with them during the late sixties. The Idle Race had a cult following and critical acclaim, but never really broke through commercially. In 1970, Jeff joined The Move. "They were the biggest Birmingham band at the time, sort of the posh neighbours." The Move was led by Roy Wood, who was in briefly on ELO's beginnings, and drummer Bev Bevan, who along with Jeff is a founding member of the band - and still very much the man behind the skins, of course. As a member of The Move, Jeff wrote their only American hit, Do Ya, which he later re-recorded for ELO on A New World Record, and had another hit with the same song! Jeff, as mentioned earlier, is a Beatles fan, and he acknowledges the fab four as the main inspiration for ELO. A fan from their first days, he still recalls the pleasure of seeing them work on the White Album, at Abbey Road Studios in 1968, when he was in a different studio making his first recording with The Idle Race. ELO was formed in 1972 by Jeff, Bev and Roy, and their first album gave them their very first hit single, 10538 Overture. Roy Wood left shortly afterwards to form Wizzard, but it is generally thought the ELO didn't really start until ELO II with Richard Tandy moving to keyboards, and helping Jeff to create the band's current unique sound, developed more and more over the recent years by the present-day line-up of Jeff, Bev, Richard, Kelly Groucutt on bass, Melvyn Gale and Hugh McDowell on cellos, and Mik of course on violin. And it's Mik who brings us up to date with the latest news on the band. "What we'd really like is a number one hit in Britain. Believe it or not, we've never yet achieved that over here." Certainly, the band should achieve that before too long, because more than anything else, they really know each other's strengths by now, and it can only be a matter of time before these gel into a track that blasts to the very top of the charts. The sort of organised thinking that lies behind ELO is explained by Mik. 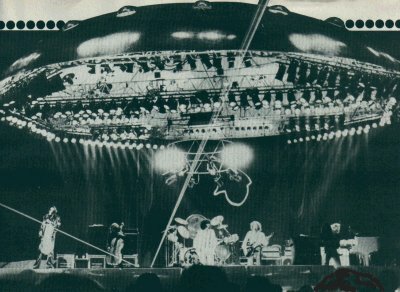 "During our shows on the last American tour, we used the massive saucer from the cover of Out Of The Blue as a stage ornament. We arranged it so that we did one show with the saucer, then played a 'B' show without it while it was being transported to the next venue. One show with, one show without. You know, that saucer took three trucks to transport it around the country." Like we said, an organised band are the Electric Light Orchestra.